As Luis Enrique addresses his players ahead of Spain’s Euro 2020 qualifier against Malta on Monday, Gerard Pique and Xavi will be putting on their boots over 2,280 kilometres away in Girona. Not too long ago, both players would have been central to the Spanish national team and their preparations on the evening before a qualifier. Now, having both retired from ‘International football’ they are playing for what they see as their ‘true’ national side. On Monday evening, Catalonia will face Venezuela in a friendly match in Girona. It’s not the first time that the national team of one of Spain’s most infamous regions has played in its own right and it won’t be the last. But this may well be the most talked about and possibly controversial of the 48 fixtures to date. 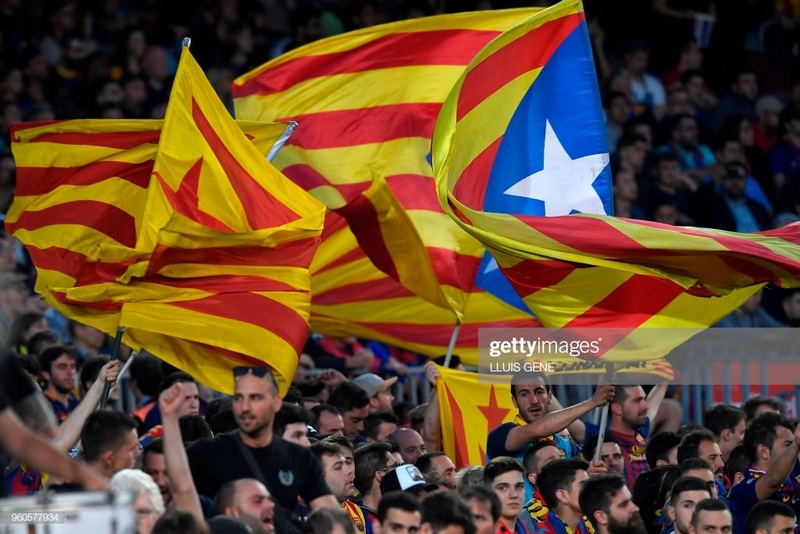 Given the current political situation in Spain, there is certainly a degree of animosity to Catalonia taking to the field for the first time since 2015. To give it it’s true title, this match will be a non-FIFA friendly. With the Catalan team not recognised by football’s governing body, the match listing is not visible on the Uefa website, nor the FIFA one and will likely go missed by many amidst the hundreds of matches taking place over the weekend. But for those of Catalonia, it means quite a lot. Especially those who will actually be inside the Estadi Montilivi to watch on as Xavi and Pique take on Venezuela. The current state of play is that Catalonia is a semi-autonomous region in the northeast of Spain. There was a referendum in October 2017, some say it was unofficial and others illegal, in which 92 per cent of voters from the region voted to leave the country. The ramifications are still being felt now, although it has slightly quietened down in recent months. It is against this backdrop that Catalonia plays their latest match. They have had many star names turn out for them before with Barcelona being located in the region. Pep Guardiola played a handful of games, Albert Ferrer, Cesc Fabregas, Carles Puyol and Victor Valdes have all represented their home region too. Pique will be playing his tenth match for the team on Monday and relishing the opportunity. Few in the Spanish limelight have been as outspoken as Pique when it comes to Catalonia and the independence question. It must be noted that the Barcelona defender has never aired his views on Catalan independence but merely believes that it should be discussed and without prosecution. In Madrid, there was a backlash against Pique’s decision to play given that less than a year ago he retired from Spain duty claiming he needed more time to focus on Barcelona. There does seem to be greater enthusiasm than ever for representing Catalonia and donning the traditional strip of yellow with red stripes. Marc Bartra, the Real Betis defender, has also been named by coach Gerard Lopez in his 20-man squad. Oriol Romeu, the Southampton midfielder, and Brighton defender Martin Montoya will take part as will Bojan Krkic of Stoke along with Eibar players Marc Cucurella and Marc Cardona, and the evergreen Sergio Garcia of Espanyol. However, there has been resistance with Rayo Vallecano blocking Alberto Garcia and Alex Moreno from joining up with the squad. Huesca have also decided not to release two of their players, Alex Gallar and Enric Gallego, for the match. Whilst Gerard Deulofeu is still trying to persuade Watford to let him join up in time for Monday. Players from Valladolid have also not been allowed to play and their manager, Sergio Gonzalez, who was due to be Lopez’s assistant, has been vetoed too. There has never been so much fuss about call-ups for Catalonia but, then again, they have usually played at Christmas or in summer rather than a certified FIFA international break. It is within reason that players have not been allowed to attend because their clubs are in relegation trouble at the business end of the season. Catalonia is a hotbed for football, with the region providing three teams in this season’s La Liga, and has produced many a great player. Xavi being the best of them. He will be the biggest draw in Girona on Monday. The former Barcelona midfielder won 25 trophies at the club and led Spain to two European Championships and a World Cup. Currently playing in Qatar with Al-Sadd, the 39-year old is certainly still capable of pulling off a trick or three. Born in Terrassa on the outskirts of Barcelona in Catalonia, Xavi came through the famed La Masia youth system at Barcelona. His affinity with the Catalonia team is strong and, hence, why he has travelled over for this 13th and final appearance. Pre-match there will be a short tribute to the midfielder, he wouldn’t want it to last long, and it promises to be an emotional night. His final game in Spain, will be in Catalonia, his home. And yet, such sentimentality will not be widespread as this is seen in the eyes of some as wrong and irrelevant. Spain facing Malta in Ta’Qali the following evening is what Spanish eyes should be fixed on, according to many in Madrid and beyond.